Precious is a celebration of all things quintessentially British. Ideal for a new baby in luxury alpaca & silk yarn. 4 x50g balls of Baby Alpaca & Silk in 4ply. 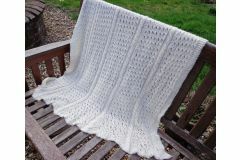 Can also be knitted in Superfine Alpaca 4ply. Pair of 4.5mm straight needles for the main bady.